Former Pompey defender Sol Campbell has been appointed manager of League Two side Macclesfield Town. 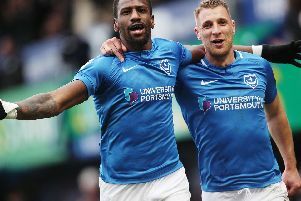 The ex-England international, who captained Portsmouth to victory in the FA Cup, has been trying to get into management since retiring from professional football in 2011. Campbell is set to have a job on his hands however as the Silkmen sit bottom of the Football League with just ten points. Manager Mark Yates was sacked last month following Macclesfield Town’s dire start to life in League Two after winning promotion from the National League at the end of 2017-18 season. Campbell was rumoured to be in talks with the Silkmen over the vacant managerial position last week. Macclesfield Town teased Campbell’s appointment tweeting a picture of a bottle of Sol beer with the caption ‘drink anyone’, before officially announcing today (November 27) that he is set to take the reins at Moss Rose. a statement the club said: ‘Macclesfield Town are delighted to announce that former Arsenal and England defender Sol Campbell is to become our new First Team Manager, after agreeing an eighteen month deal with the club. Campbell will officially be unveiled as Macclesfield Town manager on Thursday (November 29) during a press conference. Earlier this year Campbell told the The News that he would love to return to Pompey. He said: ‘My heart and soul is burning to get back in. It would be great if something happens.